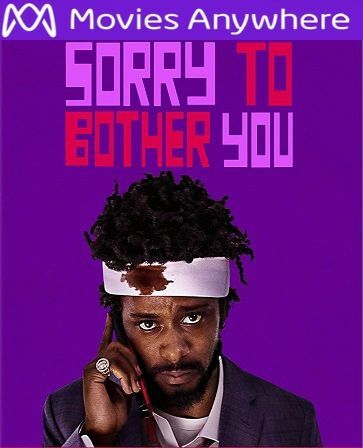 Digital UltraViolet and Digital Copy will makes it possible for you to stream the movie Sorry To Bother You HD UV or iTunes Code instantly to your computer and compatible Smartphones, Andriod, iphone, iPod Touch, iPad and tablets devices anytime, anywhere. You can also download a Digital UltraViolet Copy or a Digital Copy of the movie Sorry To Bother You HD UV or iTunes Code to your computer and compatible devices. "Sorry To Bother You" (2018 release; 105 min.) brings the story of Cassius "Cash" Green. As the movie opens, he is caught lying on his resume during a job interview at RegalView Telemarketing. He can't believe his good luck when he's offered the job anyway. "Just stick to the script", his new boss tells him. Later we get to know Cash's fiancee Detroit. When Cash starts his job selling encyclopedias, it takes him a while to find his groove. An older coworker gives him some advice: "Use the white voice"... At this point we are 10 min. into the movie but to tell you more of the plot would spoil your viewing experience, you'll just have to see for yourself how it all plays out. Couple of comments: this is the movie writing-directing debut of Boots Riley, best known for his rapping band The Coup (whose 2012 album is also called "Sorry to Bother You"). Here he goes the social satire route, by way of a wild (and wildly imaginative) tale set in Oakland in the near future. The farther we get into the movie, the crazier it becomes. Riley tackles many issues, including racial stereotyping and prejudice, cheap labor/unionization, police brutality, and so on. Yet the movie is at times hilariously funny too. In other words: this movie is all over the map. Sometimes it works, other times it steers off course, if not off the tracks altogether. LaKeith Stanfield, best known for his prior role as Snoop Dogg in "Straight Outta Compton", delivers another outstanding performance as Cash. Danny Glover has a small role as the older coworker. If I have one word of caution, it's that the movie's trailer, which I had seen, is not indicative of what the full movie really is all about. So keep an open mind, and roll along with the punches. "Sorry To Bother You" premiered at this year's Sundance festival to immediate buzz and critical acclaim. The movie finally expanded wider this weekend, and opened on about 6-7 screens for all of Greater Cincinnati. The Friday early evening screening where I saw this at was not attended well at all, much to my surprise. If you are in the mood for a wild and at times over the top social satire, I'd readily suggest you check out this out, be it in the theater, on VOD, or eventually on DVD/Blu-ray.